The Douglas manufacturing company was founded in 1882 as a family business which branched out into motorcycle manufacturing in 1907. Douglas venture into motorcycle making began when one of their customers, Joseph F. Barter’s Light Motors Ltd. Joseph F. Barter’s Light Motors Ltd. designed their “Fée” (i.e. Fairy) system for mounting an engine in a bicycle. The system was developed from a single cylinder to a horizontally opposed twin cylinder and was in regular production by 1905 with Douglas making the castings for the machines. Joseph F. Barter’s Light Motors Ltd. went out of business in 1907 but Douglas took over manufacturing the “Fairy” bikes with their horizontally opposed engines and thus became a motorcycle manufacturer. 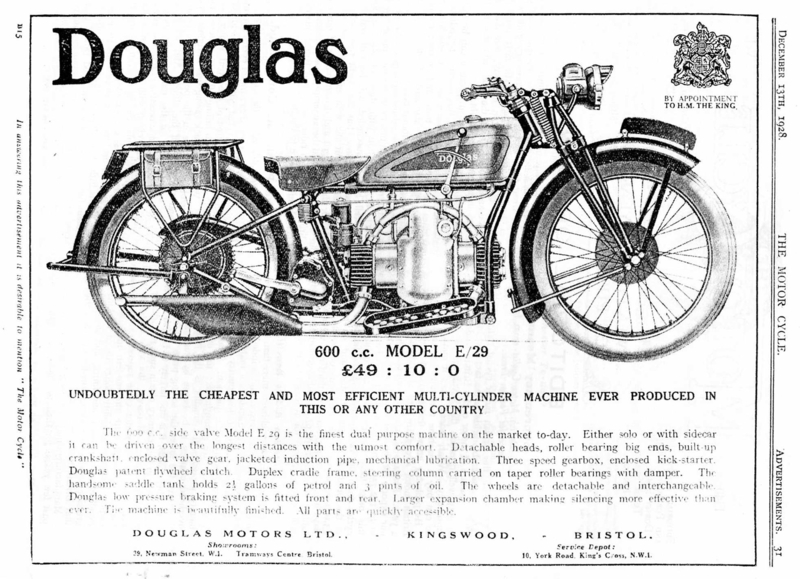 By the outbreak of the First World War Douglas were building motorcycles the equal of any in the world. They made over 70,000 motorcycles for the military. (Picture courtesy “War Machines” at columnm.com). 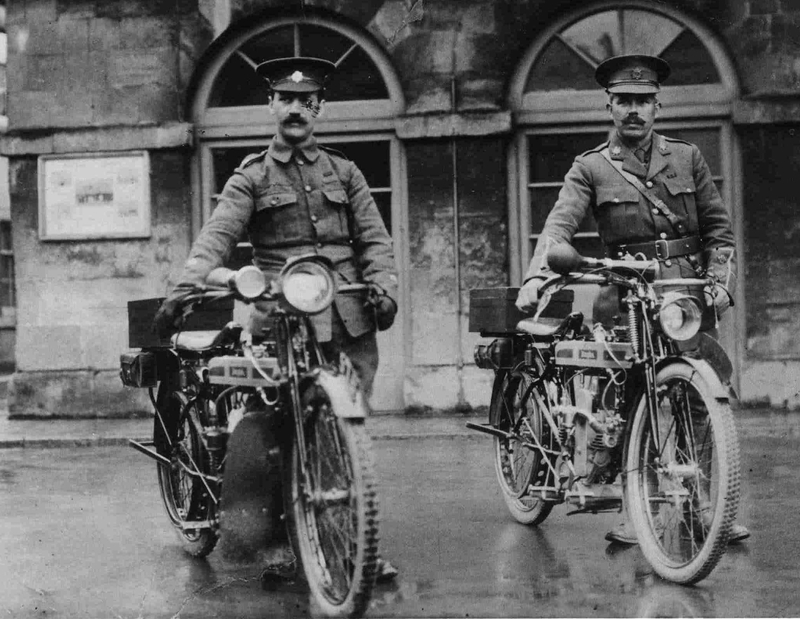 With the outbreak of the First World War Douglas were commissioned to supply motorcycles for the British Military. Their motorcycle designs had matured and their horizontally opposed twin cylinder engine had established a reputation for excellence both in competition and for reliability. Douglas made about 70,000 motorcycles for the military around this time. After the war in 1919 Douglas ventured into automobile manufacture and built the Douglas cycle-car. This featured a horizontally opposed engine using a shaft drive to power the wheels. Interestingly Douglas did not apply the shaft drive to a motorcycle but instead continued to mount their horizontally opposed twin cylinder engines longitudinally in the frame mated to a chain drive. 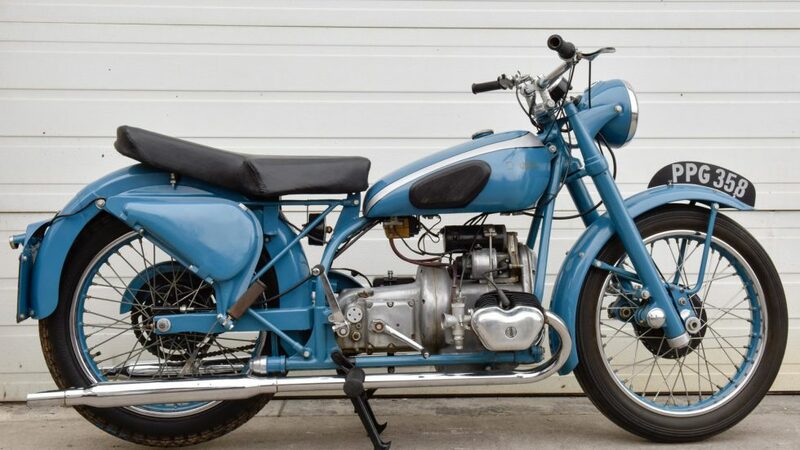 It was one of these motorcycles that BMW engineer Max Fritz borrowed from his works foreman Martin Stolle so he could reverse engineer the engine and create BMW’s horizontally opposed twin. Max Fritz rotated the engine so it was mounted transversely in the frame and did the logical thing a German engineer would do, he mated it with a shaft drive. Thus was the BMW R32 born and it would go on to prove the durability of the shaft drive and horizontally opposed engine in the Second World War and both Harley-Davidson and Indian would be asked by Uncle Sam to make similar versions of their own. 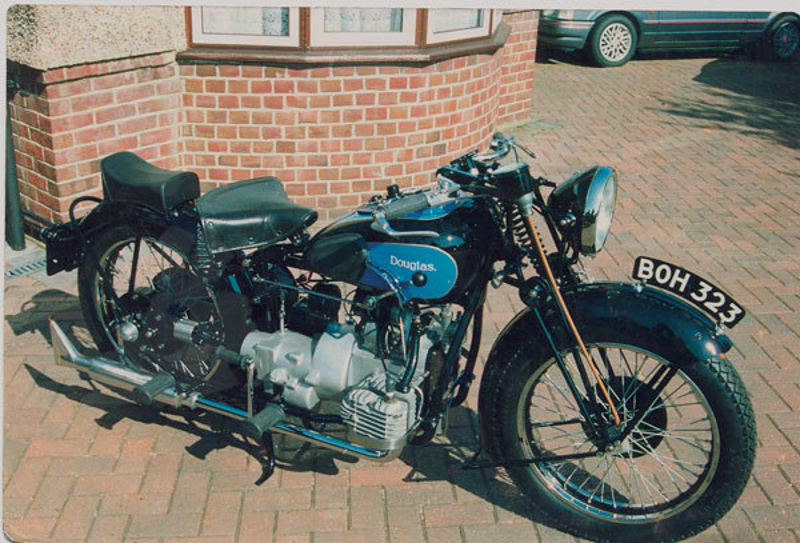 It would not be until 1935-1936 that Douglas would get around to creating a shaft drive motorcycle of their own. This was the 496cc, SV, ‘Endeavour’. A Douglas 496cc, SV, ‘Endeavour’. (Picture courtesy douglasmcc.co.uk). After the Second World War Douglas did not continue with the shaft drive Endeavor but instead kept the horizontally opposed twin cylinder engines of their bikes mounted in the transverse way of the BMW’s but reverted to a chain drive. Their Mark V was their second last model and was in production from 1949-1954. The Douglas Mark V featured an overhead valve horizontally opposed twin cylinder engine of 350cc capacity. The Mark V was made with the unusual rear suspension of its predecessor the T35. The rear swinging arm suspension being sprung by a longitudinally mounted torsion bar. Left side view of a Douglas Mark V showing the layout of the engine and gearbox unit. Chain drive, swinging arm suspension and rear brake pedal are visible in this picture. (Picture courtesy Mecum Auctions). The Douglas motorcycles from the mid thirties through to the end of production in 1957 feature the horizontally opposed engine mounted transverse in the frame and so they have a clean style about them and the engine and transmission are all very easily accessible for maintenance. Right side view of the Douglas Mark V. The gear change is foot operated and is on the right side. (Picture courtesy Mecum Auctions). 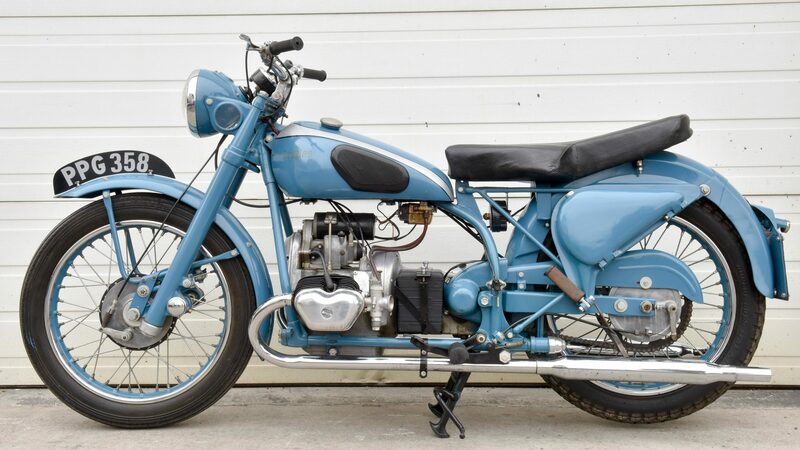 The blue 1950 Douglas Mark V motorcycle in our photographs above is coming up for sale by Mecum Auctions at their Las Vegas auction to be held between 25-28 January 2017. The bike comes with a complete spare engine. Transmission is a four speed. Douglas motorcycle aficionados will find the London Douglas Motorcycle Club home page with a detailed history of the marque and the models if you click here.